I’ve just made a dental appointment. I’m going to visit my dentist on Friday. Now, when do you go see your dentist? It’s when your tooth aches. When do you have a toothache? It’s when you have a cavity. What’s a cavity? Having a cavity means having a bad tooth or tooth decay. A cavity is actually a hole in a tooth that can grow bigger and deeper over time. 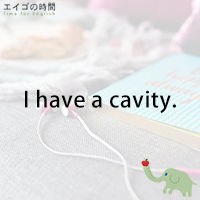 So when you have a cavity, it’s important to get it repaired right away. Brushing or flossing won’t remove the cavity. Go to the dentist and “have your cavity filled”. That’s what I’m going to do on Friday. For now I’m going to let you work on a quiz. I’ll read three sentences. Please listen carefully and choose the one that is NOT TRUE. Ready? 1. You should go to the dentist when you have a cavity. 2. You should go to the dentist when you have a sweet tooth. 3. You should go to the dentist when you have tooth decay. Next Post させる、される、してもらう – I had my hair cut.